Nur I Homestay Semi D is located in Kota Bharu, 1.6 mi from Handicraft Village and Craft Museum. Guests can enjoy the on-site restaurant. Free private parking is available on site. 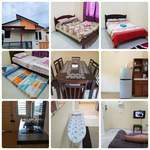 Nur I Homestay Semi D Kota Bharu is a single storey Semi D house located at Taman Uda Pengkalan Chepa Kota Bharu. The house is fully furnished. Comfortable place to stay for small family up to 15 pax. 2 Car park space. Billion Shopping Center is 2.2 mi from Nur I Homestay Semi D, while Kota Bharu Mall and Siti Khadijah Market are 2.2 mi from the property. The nearest airport is Sultan Ismail Petra Airport, 3.1 mi from Nur I Homestay Semi D.
*NOTES : Safety refundable cash deposit RM100 is required upon guest check in.